With reference to “Oracle Lifetime Support Policy”, Oracle E-Business Suite Release 11i Tier 1 support services are extended for another year running from 01-Jan-2017 through 31-Dec-2017. 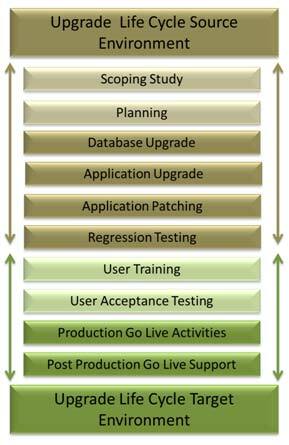 Above table illustrates the support timelines for all EBS releases. The customers who have decided to remain on R11i/R12 will need to pay additional fee for support and ensure they have all the latest and greatest patches applied to their system. Or E-Business Suite customers on 11i or 12.0 now have the other choice to move either to 12.1 or to 12.2. A direct upgrade to 12.1 is supported from 11.5.9 or higher, and a direct upgrade to 12.2 is supported from 11.5.10 CU2 or higher. In evaluating any upgrade, there are many factors to consider, such as support timeframes, functional capabilities, technical infrastructure, and underlying business needs. eBiZure can assist your organization to upgrade your application and databases to the current available version. The major tasks involved in any technical upgrade are a) Database Upgrade b) Middleware TechStack Upgrade and c) Application Upgrade. eBiZure recommends at least three technical iterations before the production cutover is carried out. The first iteration is for proof of concept and upgrade documentation specific to your environment is prepared post first iteration. The second iteration is to consolidate and validate the documentation prepared post first iteration and also to note down the time consumed for each activity and make an estimate for production upgrade downtime window. The third iteration is carried out to better the upgrade timing and plan the strategy for production cut over. Please contact eBiZure technical team for next level discussions in case you want to upgrade your current environment to next level.